There’s something about luscious string instruments that bring out the best that music has to offer. Know thy history. When the Drifters shifted from Clyde McPhatter to Ben E. King, they ushered in a new sound with string instruments. The Sound of Philadelphia was also string heavy with the help of the Salsoul Orchestra. When Barry White made his debut, some thought, “Who is this Isaac Hayes sound alike?” Ah, not so fast to judge. Radio jocks used to refer to White as ‘the maestro.’ What’s a maestro? A master in art. A composer, conductor or music teacher. Barry White was indeed all that and beyond. 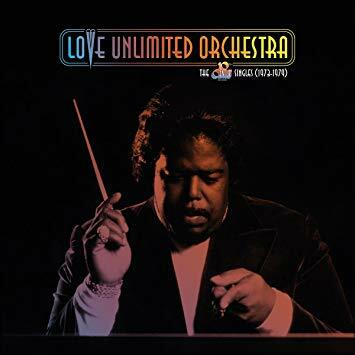 After he unveiled his female trio, Love Unlimited, he was the brains behind a forty piece orchestra called, what else, the Love Unlimited Orchestra. Besides backing up White and his trio, other famous artists got their breaks from LUO including Kenny G, Lee Ritenour, Wah Wah Watson, and Ray Parker Jr.
Now, 20th Century Records has just released a two disc “best of” compilation from LUO, spanning the years 1973 to 1979. Disc one opens up with “Love’s Theme.” Why not! It was their biggest hit and put them on the map. Barry White’s fingers are all over just about every single. “Rhapsody in White” starts off like “Love’s Theme” but then fools you—it’s way more upbeat. “Barry’s Theme,” named after guess who, is LUO paying homage to the maestro. White appears vocally on “Baby Blues,” giving us that often imitated delivery. Disc two gets into disco. “Brazilian Love Song” makes one want to do the hustle. Speaking of Isaac Hayes, LUO also covers the “Theme from Shaft,” but their version is a little more up tempo, and Barry White has no cameo like Hayes on the original. Love Unlimited Orchestra’s 20th Century Singles (1973 -1979) is for the lover. It’s close your eyes and relax music. However you choose to listen, it’s great to see LUO’s work get more attention.